UTC+03:00 is an identifier for a time offset from UTC of +03. In areas using this time offset, the time is three hours later than the Coordinated Universal Time (UTC). Following the ISO 8601 standard, a time with this offset would be written as, for example, 2019-02-08T23:36:06+03:00. Some areas in the world use UTC+03:00 all year. Most of European Russia, including Moscow, St. Petersburg, Rostov-on-Don, Novaya Zemlya, Franz Josef Land. From October 26, 2014 Moscow and most other parts of European Russia started using UTC+03:00 again, all year around. Also on September 7, 2016, Turkey started using UTC+03:00 all year round. 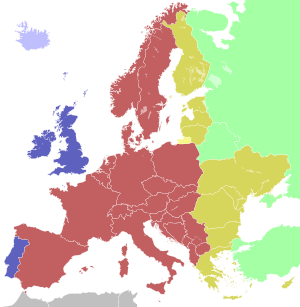 Besides the names mentioned above, the name 'Eastern Europe Forward Time' (EEFT) is sometimes used. Not to be confused with Atlantic Standard Time. The easternmost point at UTC+03:00 is the easternmost point of Saudi Arabia, in the Eastern Province, at the border with Oman, with a longitude of roughly 55°20' E.
The westernmost point at UTC+03:00 is the westernmost point of contiguous Russia, near Lavry, Pskov Oblast 27°19 time zone employed there (corresponding to 60°E) is 33°41' E of physical time, i.e. roughly 1 hour and 14 minutes ahead of pysical time, making for the largest discrepancy between time used and physical time for UTC+03:00. This is the largest discrepancy between time used and physical time for UTC+03:00. The easternmost point at UTC+03:00 is Cape Zhelaniya, Severny Island, Novaya Zemlya, Russia (69°06' E). the time zone employed there (corresponding to 45°E) is 24°06' W of physical time, i.e. roughly 1 hour and 36 minutes behind physical time, making for the largest discrepancy between time used and physical time for UTC+03:00. On February 8, 2011, Russian President Dmitry Medvedev issued a decree cancelling DST in Russia. Under the decree, all clocks in Russia advanced by 1 hour on March 27, 2011, but did not change back the following October, effectively making Kaliningrad Time UTC+03:00 permanently, and Moscow Time UTC+04:00 permanently. This proved unpopular because of the dark mornings, children walking to school and people going to work in complete darkness. On October 26, 2014 Russia permanently returned to winter time by setting the clocks back by 1 hour effectively making Kaliningrad Time UTC+02:00 permanently and Moscow Time UTC+03:00 permanently. Ukraine had UTC+02:00 plus regularly EEST from 1992 till 2011 (in years 1981–89 Moscow Summer Time) until the Ukrainian parliament added 1 hour "on the territory of Ukraine from March 27, 2011" and canceled DST on September 20, 2011 de facto making EEST (UTC+03:00) the new standard time. After strong criticism from the mass media, on 18 October 2011 the Ukrainian parliament cancelled its previous decision. ^ "Turkey Stays on Daylight Saving Time for Good". Time and Date. September 7, 2016. Retrieved September 7, 2016. ^ "Occupied Northern Cyprus to Follow Turkey Time". September 14, 2016. Retrieved September 14, 2016. 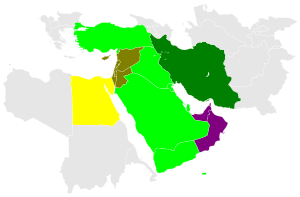 ^ "AST – Arabia Standard Time". timeanddate.com. Retrieved 31 August 2011. ^ "Winter time change will be abandoned this year". cnnturk.com. Retrieved 8 September 2016. ^ "Ukraine to return to standard time on Oct. 30 (updated)". Kyiv Post. 18 October 2011. Retrieved 18 October 2011.